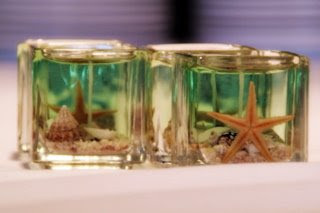 So yesterday as I'm preparing to run tomorrow's interview with the Great White Snark -- which is gonna be a doozy by the way -- I receive an email from none of other than Rebecca Sutterby of Sugar Creations, one of my previous interviewees, wanting to share with Rick and I some news. 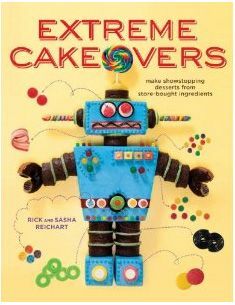 If you read Rebecca's interview, you know that during the time I was interviewing her, she was also frantically preparing her cake entry for the prestigious Oklahoma Sugar Show. Well, apparently all her hard work paid off because she took the Grand Prize! Rick and I couldn't be prouder of Rebecca! We encourage you to show Rebecca your support of her beautiful cake and all her hard work by leaving your comments here for her to read. I know she'd love to hear from y'all! 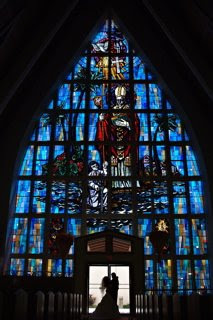 Here are the photos Rebecca sent to us which she has graciously allowed me to share with our readers. Please do not pull her photos off and use them without her permission. 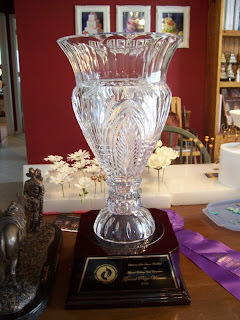 Here is the 2' tall statue that Rebecca took home, along with some serious moola. Rebecca tells us she will be purchasing a new washer and dryer. Whoo hoo! If you haven't noticed on our right sidebar of the blog, we have all our interviews archived, and as the weeks go on, we will have many more to add. We have some serious talent and personalities lined up to interview, and our next interviewees and their websites are posted on the right sidebar of our blog, so you can get to know their work in advance and find out when the interview will run. Thank you to everyone who has been posting comments, and sending emails with their appreciation about the blog and interviews. Hope you are having fun! See you tomorrow with our next interview! 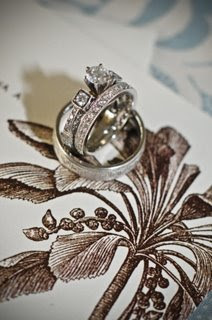 The week is always off to a great start when we receive a selection of beautiful images from a photographer. When the photos arrive to us, it is like a gift that instantly transports us back to the day of the wedding, when we remember our lovely couple and of course, their cake. 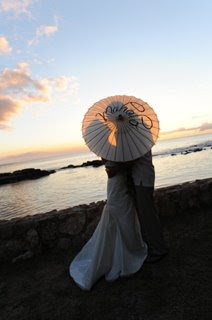 This week’s photographic gift came courtesy of the very talented Rachel Robertson Photography who sent us images of Heather and Mark’s wedding, which took place on August 14, 2008 at one of our favorite reception locations, Lanikuhonua. 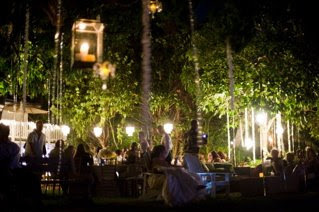 Heather and Mark reside on the East Coast and we didn’t get the opportunity to meet with them before the wedding, but I had plenty of communications with Heather and her wedding coordinator Alia, from Parasol Events. 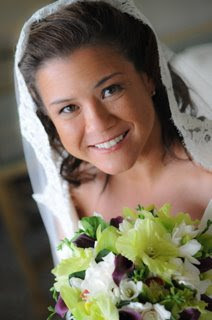 Heather is one of those sweet, easy-going brides we love to work with. 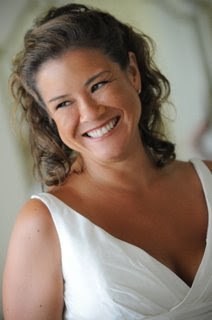 She was very excited about her white fondant wedding cake and the flavors she chose to serve to her guests -- Local Kine Special and Bananarama. Rick designed Heather and Mark’s cake with bunches of handcrafted green cymbidium orchids and freesia and bamboo borders to give the cake a Hawaiian touch. Working with her coordinator Alia, Heather lined up an A-list of vendors including Rachel Robertson Photography, Flowergirls, Creations in Catering, and cakelava for her wedding cake. 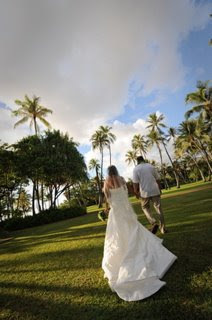 A warm Mahalo to Rachel Robertson for sharing with us her gorgeous images. 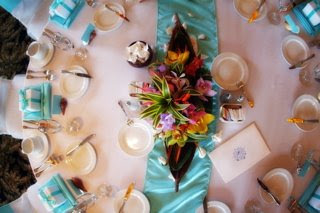 We were fortunate enough to work with Rachel again last night at another exquisite wedding. 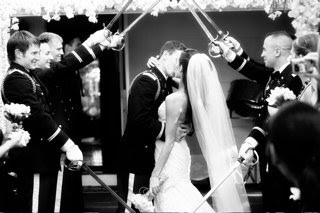 Be sure to check out Rachel’s website and blog to see her amazing portfolio! See Heather and Mark's cake and many more on cakelava.com. 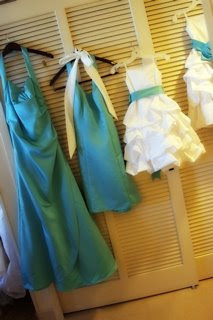 Hope you enjoyed the photos of the tiffany blue and white themed wedding we've been running for the past few days. Rick and I have been out of town on a working vacation, doing a shoot for a national TV show. Mum's the word on any of the details -- we're not at liberty to say -- but we'd like to thank those who we worked with on the shoot (you know who you are) for their time and support. For people who have been trying to reach us (you also know who you are) via emails and voicemails, I do apologize for the delayed response. We recently returned and are just getting back into the swing of things and will respond shortly. Thank you for your patience. We will resume the blog on Monday and have a fantastic week lined up, including my 2-part interview with one of our favorite bloggers, The Great White Snark. 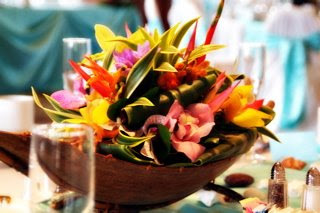 Aloha, and enjoy the weekend! 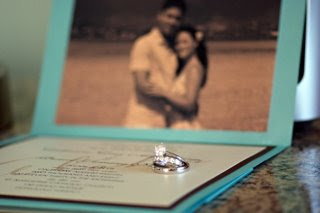 Dave Miyamoto also sent us, as an added bonus, some photos from Cat & Romel's engagement session. How could we resist not posting these beauties? See a full view of Cat's beautiful cake in a previous post, Those Tiffany Blues. 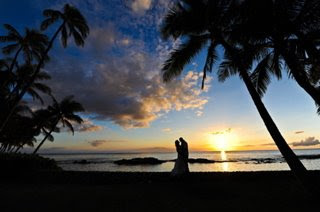 A little over a week ago, our clients Natalie and Justin flew in from Kodiak, Alaska to kick-off the start of their wedding week with their friends and family. The last couple weeks we've had a mild case of Alaska Fever -- Sarah Palin, Senator Ted Stevens, America's Toughest Jobs (which we occasionally watch), and Natalie and Justin. Unlike the frenzy surrounding the politicians in Alaska, Natalie and Justin are pure genuine Alaska Gold as far as we're concerned. I'll explain. Shortly after arriving on Oahu, Natalie, Justin and her mother came to our studio for their cake tasting. 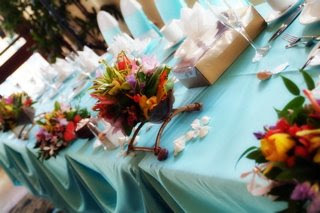 We were tightly booked that day and seemed to go from one event to another. The day felt hectic, but once we started talking to the three of them, we felt instantly at ease and ended up exchanging stories for a while. Before they left, they had gifted us with a small can of Alaskan salmon, which Justin had caught and canned. We were touched by the gesture and Justin explained there was more where that came from. He told us that they had brought over a bunch of frozen Alaskan fish that he had caught and he would have some waiting for us in a cooler when we arrived to deliver their wedding and groom's cakes. It was a strange concept really, drop off cakes, pick up fish, but it sounded great to us! Last week, we delivered two awesome cakes to the couple, one being their wedding cake, and I will wait for their photographers Stefanie and Anna Riedel's photos to reveal that one, and this super cool ATV groom's cake for Justin. After we carefully placed their 2 cakes on their designated tables, we saw a cooler marked for 'Rick and Sasha' and opened it to reveal fish galore. Beautiful black cod, white salmon, and more salmon of the traditional orange/pink color. There aren't enough nights in the week to finish all the fish. I cooked the black cod one night and boy, was it delicious, and a couple nights later, one of the vacuum packs of the salmon. We have plans with a friend to take one of the larger packs over for a BBQ. We've been tipped before, and occasionally receive gifts, but this was a really special gift. Flown over all the way from Alaska to share, Rick and I are were practically speechless and want to express our gratitude to the couple. 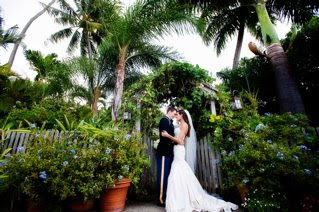 Natalie and Justin, have an amazing life together. We will never forget you! 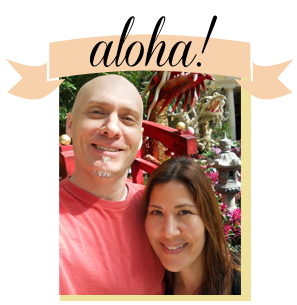 Here in Hawaii, the big carnivals are the Punahou Carnival and the 50th State Fair, neither of which happen to be going on this past weekend, but that didn't stop our client Tricia from having a carnival themed party at her home, in celebration of her son Ethan's 1st birthday. 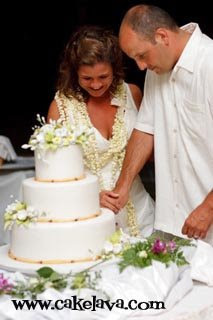 Tricia gave Rick full artistic reign on the cake design and he in turn gave them a cake they would never forget. Since this was a Hawaii themed carnival Rick added in little shave ice cones and SPAM musubi's. Keeping with the local flavor, Tricia ordered our signature Local Kine Special flavor (coconut cake with a taro cream filling) and ever-popular Hot Fudge Sundae. We wish Ethan the happiest of birthdays! 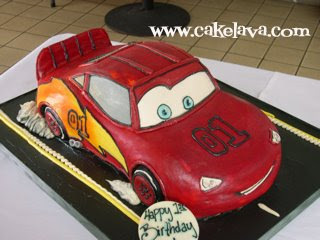 See our carnival themed cake and many more new cakes recently posted on cakelava.com. Rick has been a fan of the Volkswagen Bus for many years. When we met, he owned one, and he's always loved the tricked-out VW buses. 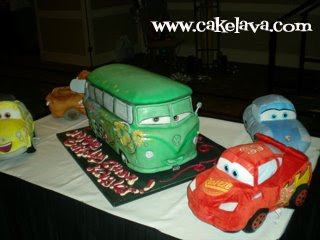 Since we started making the sculpted Disney's CARS cakes (see below), shortly after the movie was released, Rick has been wanting to make "Fillmore", the grooviest CARS cake of them all. Last weekend he got his chance, when we brought the birthday boy Ethan his very own sculpted "Fillmore" cake, that his mommy and daddy were terribly excited about ordering for him. It's always nice to walk into a room and see props that match the theme, and the decor did not disappoint -- table centerpieces were CARS, the balloons were CARS, there were checkerboard patterns in the room, and lo and behold, our cake table was covered with some of Fillmore's stuffed vehicular buddies waiting to welcome him. We moved them away to give Fillmore his time in front of the camera and then one-by-one placed them back next to him so they could all co-exist peacefully in his groovy world. 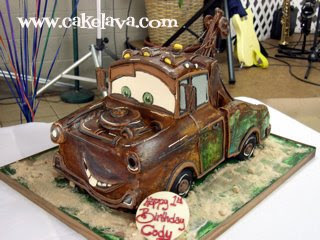 Two of our other CARS cakes, Lightning McQueen and the Ghetto-ist of them all, Towmater. See these and many other cakes that go "Vrroom!" 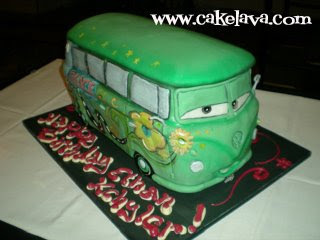 on cakelava.com. Things get even sweeter. Part 2 of my interview with Rebecca. Click here for Pt. 1. SR: What are the top three favorite cakes you have made? RS: Oh man, that’s like asking me to choose a favorite child! Normally, my answer is “the cake I’m working on right now!” LOL – but if you’re going to make me pick . . . .
SR: Both Sugar Creations and cakelava were selected for People Magazine’s “A Cake in Every State” wedding feature. Your cake was beautiful, by the way! 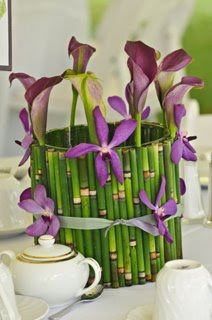 We noticed when the magazine was released, our all-bamboo design was even more requested than before. 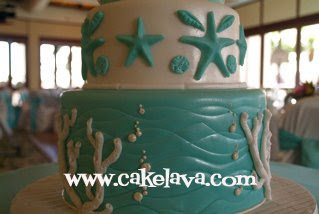 Did you find the same to be true with your winning cake and do you still have people asking for that design? RS: Actually, I’ve only made a similar swag design once since then. LOL – see, I told ya I don’t like to make the same cake twice! Actually, I think the photo they chose for me was just sort of a generic design and nowhere near as memorable and unique as the one they chose for you. 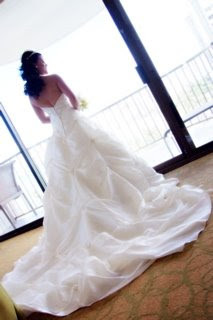 SR: Rick and I love that Sugar Creations offers a clothing line for cake enthusiasts, and brides and grooms, all designed by you. What are some of the pieces you offer in the line and how can people place an order? SR: What are your best sellers in the line? RS: Actually, the “flower girl” t-shirts are by far the most popular which sort of surprised me. 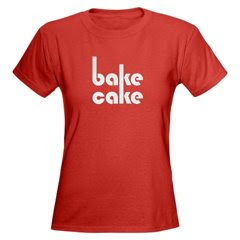 http://www.cafepress.com/sugarcreations.226320459 Next, the stuff for bakers and cake decorators sells best. 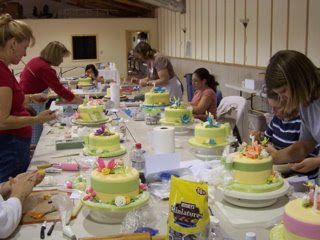 SR: We like that you are active in the cake community, writing instructional articles in American Cake Decorating magazine, giving classes and promoting other bakers all over the country on your website. What drives you to want to teach others and connect within the community? RS: I mentioned before that a lot of what I learned came from things people where willing to share on the internet. So now, I sort of feel obligated to share as well. You know what I mean? I feel like it would be wrong to sponge up all that free information and run. Plus, I’m not finished learning, so if I share what I know, hopefully others will let me in on their tips and secrets as well! SR: How long have you been teaching classes for? Are the attendees mostly professional decorators or people learning for more recreational purposes? 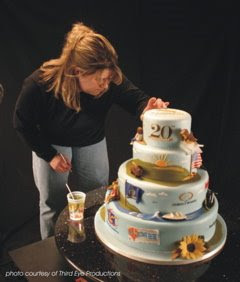 RS: In 2004, I taught a series of beginning cake decorating classes at a local community college. Those students were mostly recreational decorators. I’m not all that comfortable speaking in front of groups, though, and didn’t really think teaching in a class format was much fun. Last year, people started e-mailing asking about classes on a regular basis, and one day after 2 e-mails and a phone call within just a few hours, I gave in and said, “okay, I’ll schedule one for pete’s sake!” LOL – anyhow, I worked out the date and the details and posted the info and had 30 people signed up within a week. YIKES! This was more of a professional level class and I hosted it here in my tiny little hometown. We rented a log cabin reception hall overlooking a pond just outside of “town” and people came from 15 different states to attend. I think a good time was had by all (including me) even though nobody’s cell phones had a signal out there. I still plan to keep the classes to a minimum because I just don’t want to be traveling a whole lot, but I am teaching one in Georgia at the end of October, and in South Texas next April. SR: I asked Beryl (Byrd, of Just Fabulous Pastries) this as well. I know it’s a difficult question. Who are your top five cake designers, or people you draw inspiration from in your field? RS: Ron Ben for his style, Colette for her creativity, Alan Dunn and Nic Lodge for their flowers, Kerry Vincent for her precision, and Mike McCarey for his 3D work. Okay, that was 6, but who’s counting. SR: They are all wonderful designers and some of our favorites are in your list as well. What do you like to do when you aren’t making cakes? RS: Well, we live out in the country on a few acres and have 3 sons ages 11, 9, and 6. Between the livestock, the boys’ activities, and daily chores like laundry there’s not a much chance I’ll ever get bored. Once upon a time I liked to cross-stitch and sew, but I think the last time I touched my sewing machine was to make my tablecloth for last year’s National Wedding Cake entry. SR: What’s next for Sugar Creations? RS: Hmmm . . . good question. I wish I had a crystal ball and knew the answer to that! For now, I’ll keep plugging along just baking. When the boys are a little older and less demanding of my time, I would like to travel more to teach and eventually write a book. That’s a ways down the road, though . . . . my main focus for now is just putting out a quality product and letting the chips fall where they may. SR: It sounds like the present is keeping you plenty satisfied and busy, and the future certainly looks bright for Sugar Creations. We hope you knock ‘em dead in Tulsa! If cake designer Rebecca Sutterby’s cakes look familiar to you, it’s probably because they show up everywhere. You may have seen Rebecca, who owns Sugar Creations, in Savonburg, Kansas, competing on a Food Network Cake Challenge. 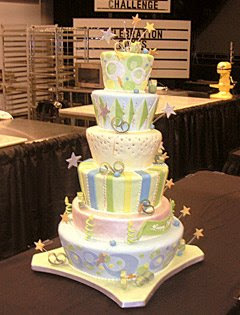 Maybe you witnessed one of her spectacular cakes at the prestigious National Wedding Cake Competition in Tulsa, Oklahoma. Perhaps you were a student in one of her well-attended cake decorating classes, or if you live in Kansas, happened to catch her doing an instructional cake demo on a morning news show, which, by the way, you can find the videos archived on her myspace page . Regardless of how you’ve encountered Rebecca’s cakes, chances are they left an impression that makes her design style instantly recognizable, and if you don’t know Rebecca’s work, then you should. This past week I had the opportunity to interview Rebecca Sutterby. Bless her heart, the same week I interview her she is frantically preparing for her upcoming competition in Tulsa next week. She was such a great sport to answer all my questions with the amount of detail given, and something about our exchanges told me she is a Really Nice Person. 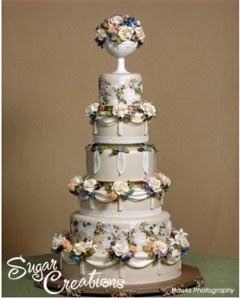 Rick and I would like to thank Rebecca for all her time and allowing us in to the sweet, sweet world of Sugar Creations. We hope she takes the top prize at the fair! 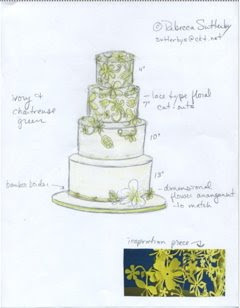 Sasha Reichart: Let’s talk about the beginning of your career in cake design. When did it start and what led you to focus on cakes specifically? Rebecca Sutterby: Well, I’ve always been a baker. I started baking cookies by myself when I was 11. I was Student Council president of my high school my senior year, and at Easter, I got the bright idea that I should bake cookies for StuCo to pass out to everyone after lunch. So I did – 12 dozen iced sugar cookies – ducks and bunnies and eggs – and yes, that was enough for the whole school. In February 1998, I decided to take the Wilton I class at a local craft store so that I could make a nice cake for my oldest son’s first birthday. In May 1998, my husband’s sister got married. She figured since I took the class, I was an expert, right? 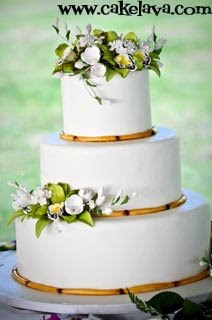 LOL – well, she had to ask me 4 times, but I finally agreed to make her wedding cake. So then I started getting a few other requests from friends and relatives getting married. After about 4 wedding cakes, I started getting requests from people whom I didn’t know and quickly realized that if people were going to keep asking, I better learn how to do it correctly. I had 2 infant/toddler sons by then, so taking classes wasn’t an option. I started buying cake decorating books and absorbing anything I could learn from the internet. 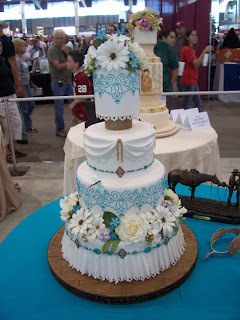 In 2001, I taught myself how to make gumpaste flowers and entered the Oklahoma Sugar Art show for the first time. Of course, that was a big wake-up call for how much more there was to learn, and I’ve been tackling that challenge ever since. Sasha Reichart: Wow! You are obviously extremely driven. It’s no wonder you’ve been so successful. 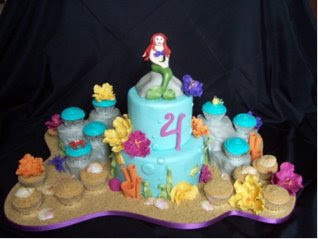 Is there a type of cake that Sugar Creations specializes in, like a signature style you have become known for? Rebecca Sutterby: No, not really. People say they can recognize my cakes anywhere, so I guess I have a certain distinguishable “style”, but I rarely make the same cake twice. SR: What are some of your most popular cake flavors? RS: I’m in a really rural area and folks around here aren’t all that adventurous when it comes to flavor. Sour cream white is what I bake most often and chocolate fudge cake with caramel-nut filling is really popular. My personal favorite is Italian Cream. Yum! SR: Yum is right! Ooh, caramel-nut, you are speaking my language. I know you have a background in graphic design. Can you share some of the ways being a graphic designer has assisted you in making cakes? 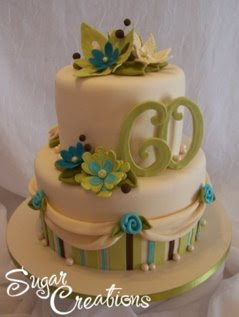 RS: I think an overall artistic vein is a definite must for cake decorators. During college and for a while afterwards, I worked for a couple printing companies in their art departments and became proficient with several types of design software. So although they weren’t teaching web design at my university in the early 90’s, knowing those types of software really well made it easier to make my own website. Also, part of my college curriculum included photography classes, so that comes in pretty handy with cakes. And I guess, most importantly, being able to visualize a design and draw it out in 3D before I start baking is a huge help. SR: Yes, being able to visualize the design in 3D would be a huge advantage. We completely agree about the necessity of having an artistic background for cake design. 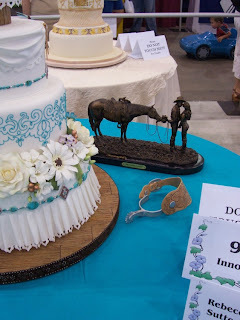 Let’s talk about the cake competitions you participate in, including the Grand National Wedding Cake Competition and the Food Network Challenges. The National Wedding Cake Competition is the most prestigious in the country, and you’ve been a 1st place winner in the past. Congratulations! What is it like to compete in such an important show? RS: Ha! Not the best time to ask me that question! This year’s show is on the 27th and I’m not anywhere near finished with my cake. The show is awesome and I wouldn’t miss it for the world, but good grief, it’s stressful! Like I mentioned, 2001 was the first year that I entered and I haven’t missed one since. I’ve always used it to teach myself new techniques and push myself beyond the familiar. I nearly always have to do everything on my entry twice – once to figure out what I’m doing and again to get it correct. But really, if anyone out there is thinking of entering, you don’t have to come out on top to be a “winner”. Don’t worry about what other people might be entering, just concentrate on making a cake that you’re proud of and everything else will fall into place. Kerry Vincent does a phenomenal PR job with the show and gets the cake photos out to more food magazines than you can imagine even existed. She sends all the photos not just the top winners, so each magazine can pick their favorites and anyone with a unique design has a great chance of getting published. 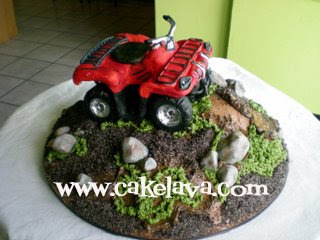 SR: How far in advance do you begin the preparations on the cake you are entering into the competition? RS: I start looking for ideas shortly after the previous year’s show ends. Well, right after that little phase where I say, “I think I’ll sit out next year” which lasts about 2 weeks. I like to have a firm plan in mind by January or February. By April/May, I want to have a detailed sketch and have usually ordered the dummies and a tablecloth. Then I always say I’ll start on it in my free time and get a jump on things, but you know how that goes! With Summer weddings, baseball games and swim lessons, there ain’t a whole lot of free time. So I always try to cut way back on orders in August and September to give myself time to work on the entry. SR: We saw you compete in the “Celebration Cakes” challenge on the Food Network. That was a fun and pretty cake! This was a difficult challenge because you hadn’t met your working partner until minutes before the competition. 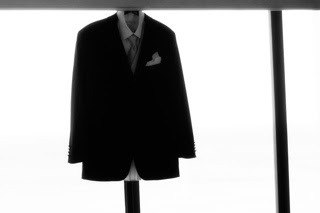 What was it like working in such a high-pressure environment with someone you didn’t know? RS: Ack! I hated that cake! You know how marathon runners just want to finish the race without walking? LOL – well, I just wanted to finish this race without making a fool of myself! Gawd, I was so nervous. I even put some of that Rescue Remedy stuff in my bottled water – you know, that stuff that they give to jittery puppies. Seriously, I was sick-to-my-stomach nervous. The FN crew were awesome, though, and Mike McCarey and Nic Lodge were fantastic to have as judges. SR: Did you have any idea prior to the competition what kind of cake you would be making? RS: I had sketched out several ideas. I wasn’t about to walk in there empty-handed. I had decided what sizes of cakes I would bake, then sat down and drew out like 10 different ideas using those sizes of cakes. The one we ended up making was a variation of the baby shower cake idea I had drawn. SR: You won your challenge! It must be absolutely magical to receive a check for $10,000 from the Food Network as Grand prize winner for all your hard work. Did you notice a change in your business after you started competing and how so? RR: The cash prize definitely made the trip worthwhile! I had to split the $ with Julie, of course, but I still have the giant check sitting here. LOL – I sent my husband to saddle-maker’s school with part of the money, bought a new dishwasher, and put the rest in the bank. Change in business? Well, I’ve been gradually bumping up my prices all along and each competition win sort of helps to validate that. 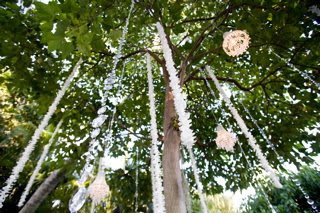 I noticed a big jump in the number of other decorators e-mailing me to ask questions since I started competing, though. Most people are super polite and I always try to help, but some people are awfully blunt. Like the lady who e-mailed and said, “I would like all of your recipes, please.” Uhhhh . . . okay?? SR: We get emails like that as well. What are people thinking asking for your recipes?? 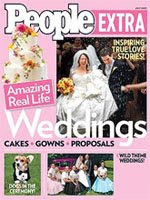 Your cake chosen by BRIDE'S magazine as one of “America’s 50 Most Beautiful Cakes” is absolutely gorgeous! Can you tell us about the inspiration for that design? RR: I have a box under my desk. It’s full of crap – pages torn from magazines, party invitations, party plates, buttons with unusual designs, greeting cards, gift bags, and who knows what else. Anytime I spot a unique pattern or design and can “see” a cake in it, I throw it in the box. When BRIDE’S magazine e-mailed and said, “we want you to submit design sketches”, I pulled out the box and started sketching. I submitted 8 different designs and they chose one. The one they picked was inspired by a chair slipcover I’d torn from a bridal magazine. Come back tomorrow for Pt. 2 of my interview with Rebecca Sutterby. Get to know her beautiful cakes by visiting Sugar Creations. 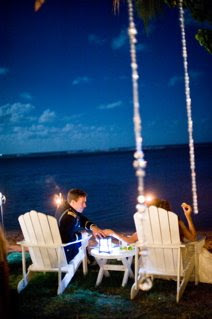 Christie and Patton were married on August 15, 2008 and have the right recipe for our next Featured Wedding on cakelava.com. Take two of the sweetest people around (who happen to be extremely easy on the eyes). 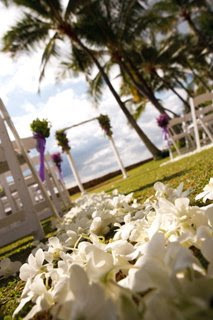 Add The Bayer Estate, a beautiful tropical ceremony and reception location. Mix-in the following A-list vendors – Visionari for photography, Designs by Hemingway for floral design, linens, lighting and crystal accents, Angel De Armas for cinematography, Ginniberries for catering, Jacque Rojas for Hair and Makeup, Accel Rentals, Showtime Djs, and yours truly on cake. 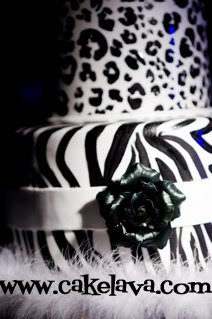 Add a heaping tablespoon of black and white throughout, and a fabulous chic wedding cake gone animalistic and it’s a recipe for an incredible wedding! 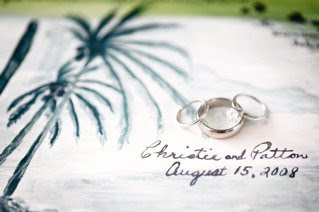 This wasn’t the first time we are featuring Christie and Patton on our blog. We wrote about the couple in a post called “From Destination i do to … I Do”. They were the photogenic cover and featured couple of Destination i Do magazine. 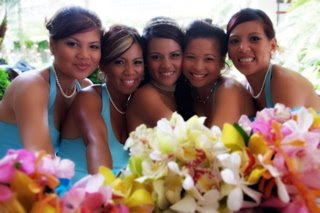 Christie is no stranger to the wedding industry, as she works for one of the best cinematographers in Hawaii, the fantastic Angel De Armas. 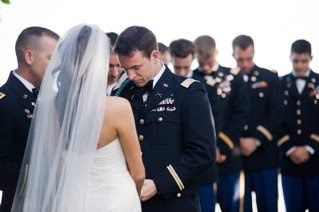 Patton is in the Army’s Special Forces division and the couple chose to have a military wedding, which we thought was a really nice touch. Christie and Patton’s cake, like our current Featured Wedding couple, Robyn and Barry, had an involved delivery. Since you don’t know exactly what the cake looks like yet, it may not be evident why it would require extra special attention. It was one of those deliveries where one of us was in the back with the cake (in this case, me) making sure nothing happened to it while the other one drove. There were many adornments on the cake that required TLC, and we weren’t about to let anything happen to Christie and Patton’s special cake. Although their color palette was black, white and accents of green, Christie and Patton went va-va-voom for the inside of their cake, choosing our signature Rainbowlicious flavor and the Hawaii Five-0. 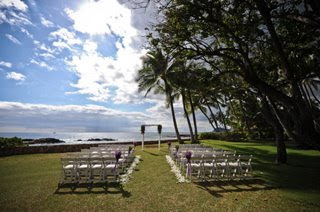 I'd love people to know that I've witnessed the hard work of all of the talented people in the industry in Hawaii and it was a pleasure to have them the day of my wedding. 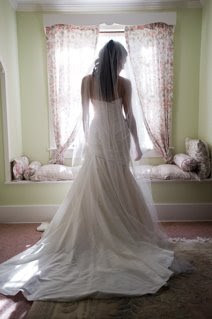 It was kind of a different I think compared to most brides....I didn't worry at all about anyone (vendors) being late or not doing the work I expected - I completely trusted them 100% - and gave almost everyone free reign in design - especially you guys and Debbie Hemingway :) I have seen what everyone is capable of and wanted each vendor to be able to shine in whatever way they were capable.....and it all meshed very well :) I just feel so blessed to have had my handpick in vendors - I never had a dream wedding growing up but once I started working with Angel (De Armas) I had my dream vendors....and I got them all on August 15th! 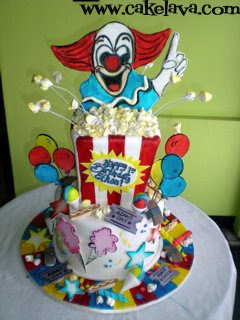 Christie and Patton, we feel honored to have worked with you and had so much fun making your cake. You are two of the most warm spirited, upbeat people around. We wish you many years of happiness! 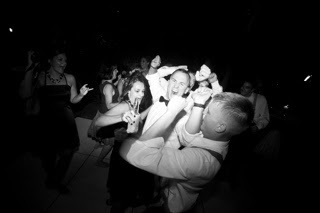 See more of Visionari's incredible images of Christie and Patton's wedding on cakelava.com this week!